I always get a little nervous when I am meeting a lot of new people for the first time, but for the meal arranged by the inimitable Kelly Lacey for the Facebook Group, Authors and Book Bloggers in Scotland, I need not have worried – what a lovely meal in excellent company. Wildwood 105-109 Lothian Rd, Edinburgh, Scotland is very centrally situated so it was easy for everybody to get to either by car or public transport. We were all seated at one long table I was sitting amidst a very jolly group and the chat flowed easily. Several bottles of Prcesso were on the table and included in the cost of our meal. It all added to the happy atmosphere. The staff were most warm and friendly without being intrusive and we all enjoyed a joke with them. The restaurant is decorated in a modern, relaxed style and, because there were so many of us, we had ordered in advance. Our starters arrived on large sharing platters these included figs and strips of pizza bread with cheese and onion jam. Everything was delicious. Main course choices included sea bass and turkey but I chose the pizza. This caused great hilarity as it was enormous and would comfortably have fed a family of five for a fortnight, I think! I thoroughly enjoyed what I had, but there was no way I could possibly finished such a large serving. Deserts included a chocoltate brownie with ice cream or a sorbet. I had the brownie. Again, this was very tasty but I had already eaten so much, perhaps I should have chosen the sorbet. All in all this was a delightful afternoon. The restaurant did not rush us at all and I had a delicious meal in fresh surroundings served by attentive staff and in good company. I highly recommend Wildwood and plan to visit again with my husband when we are in Edinburgh. It is always nice when on vacation to go for a walk to explore new surroundings and to give yourself a reward at the end of the venture. My husband and I like the village of Olhos de Agua near Albufeira in Portugal very much. On a recent visit, we walked in a different direction from usual and found the most delightful gift shop A Tulipa where we found many unusual gifts for family and friends. On our way back from the shop, we stopped off at the Caffe Crema Cafetaria for coffee and cake. What a find! The coffee is mellow, the cakes are delicious and the atmosphere is relaxed and friendly. As I say, we only stopped in for coffee and cake but at no time were we made to feel we had to hurry away. The waiting staff spoke good English and German and the restaurant is spotlessly clean. The choice of cakes, pastries and pies is excellent. There are far too many to choose from than you could imagine. I chose a cream eclair with fruit on the top and my husband went with a couple of the smaller custard tarts. All were lovely. The Caffe Crema Cafetaria does offer meals as well, including a full English Breakfast. However, although we did visit the place three times during our vacation, we never got past coffee and cake. If you happen to be in the village of Olhos de Agua, I highly recommend some shopping time at A Tulipa and then a refreshment stop at the Caffe Crema Cafetaria. I have always loved Piazza Navonna in Rome, Italy. I am entranced by the proportions of the square and fascinated by the artists who display their talents there. My daughter enjoyed watching the ‘silver man’ living staue who performed while she was there with me and, years later, when my husband treated me to a week in this fabulous city, we were keen to re-visit all the sites. The day we visited the Trevi Fountain.The Trevi Fountain is a fountain in the Trevi district in Rome, Italy, designed by Italian architect Nicola Salvi and completed by Giuseppe Pannini. Standing 26.3 metres high and 49.15 metres wide, it is the largest Baroque fountain in the city and one of the most famous fountains in the world. Tourists toss coins into the Trevi Fountain to guarantee a return visit to Rome. For many years now, the monies retrieved from the fountain have been collected, sorted, and donated to Caritas, the non-profit that provides food to the poor and homeless of Rome. After our visit to the Trevi fountain, my husband and I walked through the streets of Rome to Piazza Navonna where we treated ourselves to afternoon tea in the Ristorante Tre Scalini. This is a delightful restaurant where the staff are smartly dressed and formally courteous. My husband thoroughly enjoyed his coffee and banana split. He hadn’t had one for ages, so it was a special holiday treat. I chose a nice cup of tea and we had a lovely time, chatting about our day and planning our evening. We probably stayed far longer than an afternoon tea stop would normally justify, but at no time were we pressured or rushed or made to feel like we had overstayed our welcome. We enjoyed our visit to Ristorante Tre Scalini and would deiniftely stop there again. It is not a cheap restaurant, but it is lovely and it is in a premium situation in Piazza Navonna. I would certainly recommend it. I do enjoy Italian food! So when my daughter and son-in-law booked dinner for us at Azzurro in Eltham, I was looking forward to the meal as well as the company. The restaurant is quite small and very busy but everything is spotlessly clean and the service is attentive, but not intrusive. Azzurro in Eltham is a family run restaurant and the food is freshly cooked to order, so it is not fast food. But it is delicious food. My husbad and son-in law shared a garlic bread pizza for starters while my daughter and I nibbled on some marinated olives. For our main courses my son-in- law and I chose pizza while my daughter had pasta and my husband tucked into an Italian lamb dish. Only my husband had room for a pudding and enjoyed the tiramasu and we all had teas and coffees to round off the meal. The restaurant is not austentatious, but it is good value. I highly recommend Azzurro, if you are in the area. There are no local Indian Restaurants in our village, so, on a recent visit to London my husband and I treated ourselves to a meal at the Star of India, 267 Eltham High St, Eltham, London. What a lovely meal we had. We went for dinner fairly early after visiting relatives. The restaurant was cool and the service was relaxed and unobtrusive. The crisp, white linen table cloths made the place look clean and fresh. We ordered drinks and then our meals. My husband started with chicken pakora while I had a poppadum with pickles. Both of us enjoyed these very much. For our main courses my husband chose lamb passander and I ordered saag paneer. We requested basmati rice as well as side orders of daal and aloo gobi. It was all absolutely delicious. We thoroughly enjoyed the meal and our evening at the Star of India. If you enjoy Indian food, this restaurant is well worth a visit. On a recent visit to London my husband and I stayed in a Premier Inn Hotel. It was very conveniently situated for the plans we had and the price of accomodation was most competitive. So we checekd in to the Premier Inn, Five Ways, 738 Sidcup Rd, New Eltham, London. Our first experience of the hotel was checking in. It all went smoothly. The check-in clerk was professional, courteous and very helpful. She took time out to look up the first place we were visiting on her computer and directed us as to the best way to get there. It took a few minutes, but she could not have been kinder. We got up to our room and found it was spotlessly clean. The room was also a good size. It had not only a queen-sized bed, but also a sofa that could have been used as an extra bed, perhaps for a child if we had needed it. The bed was extremely comfortable. There was a courtesy tray with teas and coffees, extra pillows and the bath sheets were a good size. Unfortunately, the window did not open and we could not adjust the heating, so the room was uncomfortably hot at night. Also the cleaners did not refill the courtesy tray for the later days of our stay and the towels were not soft. On our first morning, there were not many people in the hotel so the famous, hot Premier Inn buffet breakfast was not on offer, but the cooked dishes were served to order, although the continental breakfast was buffet. The meal was delicious. Later in our stay, my husband was overjoyed when full buffet breakfast returned! We had an evening meal at the hotel once. It was freshly cooked and tasty. We had drinks in the hotel on another evening, there is no separate bar, but there are comfortable couches in the restaurant area to enjoy a drink. All in all, we very much enjoyed our stay and will use the Premier Inn, Five Ways, 738 Sidcup Rd, New Eltham, London again. 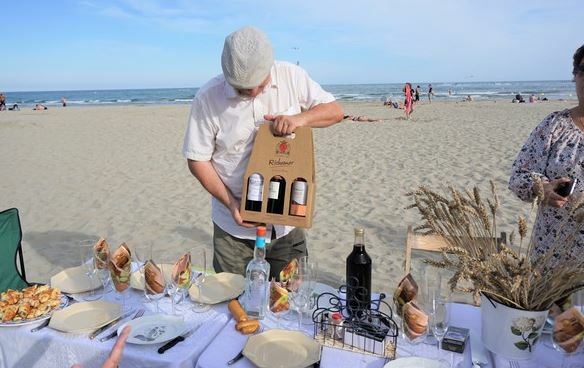 This article was first published by The Good Life, France on https://www.thegoodlifefrance.com/feel-good-real-good-fabulous-and-authentic-south-of-france-tours/ . What if you could really “do” southern France in 7 days in a truly meaningful, authentic and fabulous way? It’s just a week, but, if you know the right people and go to the right places, it really is possible to experience the very best of the south of France. The food, the sights, culture, history, wine and customs – so many things go to making this part of France a very special place. And, at TripUSAFrance they really do understand what it takes to make sure you experience all those things. This is a south of France tour that’s not rushed, not a 5-minute-tick-the-box race – but enjoyed the best way, relaxed, personal and authentic. 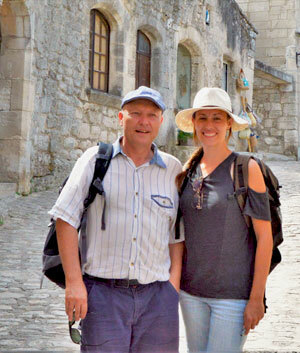 Julia and Stephane Girard-Gervois, a father and daughter team, of TripUSAFrance are two of the best guides in France. Their know-how, experience and contacts mean that you get to really know southern France in a very short space of time. TripUSAFrance’s south of France tours take in the main sites. 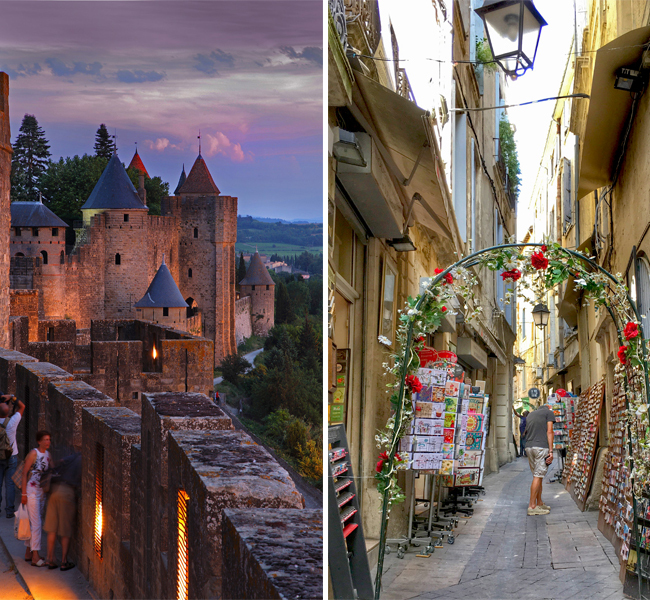 From captivating Carcassonne which looks like a fairy tale come to life, to magnificent Montpellier (where Julia grew up before moving to the USA). But with this tour you’ll also discover less well known but incredibly special places. On the itinerary are Palavas-les-Flots with an enticing beachside hotel and the Maguelone Cathedral by the sea, once lived in by Popes. In just 7 days you’ll visit legendary sites as well as Provence’s jewels. Avignon with its incredible Palace of the Popes and the stunning Pont du Gard Roman bridge. St Guilhem le Desert, one of the most beautiful villages in France and St Paul de Mausole where a troubled Van Gogh took sanctuary. Plus the famous underground art gallery Carrières Lumières and much more. Julia will reveal the best of Nimes with its amazing Roman architectures. And picturesque Aigues Mortes, plus wine tasting at the gorgeous Chateau Flaugergues and at Chateau Jonquières. You’ll have a real connection with the area, joining a French cooking class and visiting a French market. You’ll even be joining Julia’s mother for a delicious picnic by the water, where she’ll teach you to play the traditional French game of pétanque. If you’ve got an extra two days to spend in France, you can also visit stunning Aix-en-Provence, the Roman city of Arles, and the famous soap factory of Marseille (talk about the perfect souvenir to take home). Julia and Stephane like to keep their tour groups small so that they can really ensure that this is a journey you relish. You won’t be rushed on and off a bus, given 5 minutes here and 5 minutes there. That’s not the southern French way at all! You won’t spend all day on the road getting from one place to another to tick a box. The itinerary ensures you won’t spend more than a couple of hours being transported – meaning you have loads more time to really experience France. They’ve picked the best restaurants and know the chefs and the menus. If you’re a vegetarian, vegan or have food allergies then you won’t be suffering from a lack of choice here. Julia’s made sure that every chef on their itinerary can offer you something delicious. If you don’t want to learn or practice your French – that’s fine, Julia and Stephane will be with you. And, if you do want to go off for some free time, they’ll give you a cell phone so you can contact them whenever you need to. But if you do want to learn French, Julia will be happy to help you. She’s a teacher in Washington DC when she’s not guiding in France. For a feel good, real good, stress-free, everything beautifully organized, authentic, fabulous experience of the real south of France, TripUSAFrance will absolutely deliver. As Julia says “on our tours, you’re temporary locals, not average tourists bouncing around in a crowd or waiting in long lines and getting stuck in tourist traps. 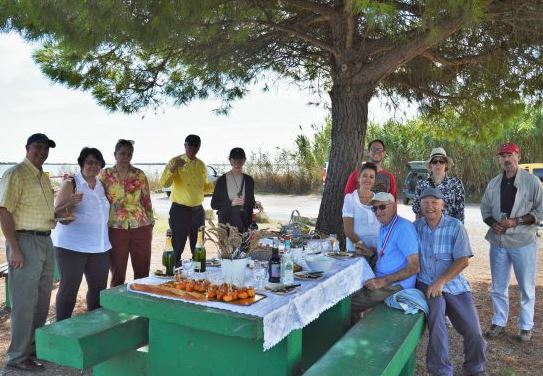 We will help you make a deeper connection with the country and understand what it is like to live there, while fulfilling the desire to see amazing sites and make lasting memories”.